When planning on using kitchen pendant lighting there is one thing that you will want to keep in mind. Kitchen lighting will usually fall into two areas: task or ambient lighting. Task lighting is used around areas such as the sink, counter tops or kitchen islands – where task and activities take place. While ambient lighting is used for general comfort. 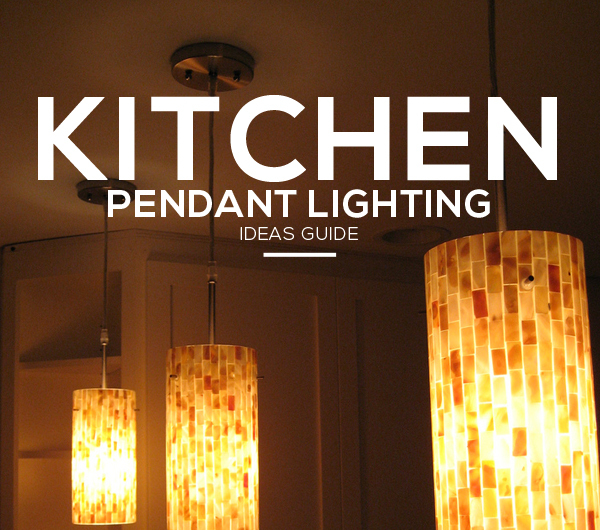 Different kitchen pendant lighting ideas are better suited for one or the other. Task lighting: You will want pendant lights where the light bulb point downwards, directing the light down onto surface. Kitchen island lighting will usually require pendant lights that focus the lights downwards. Sinks and other counter tops will usually have recessed lights or under cabinet lighting providing light. Ambient lighting: For this type of lighting, the light bulbs can are generally facing upwards, providing a softer glow of light compared to task lighting. Kitchen pendant lighting can either come as single or multiple lamps. Multiple lamps, such as a 3 light pendant, helps provide more lighting using only one light outlet. Keep an eye out for adjustable lights such as a pull down pendant light, or rise and fall fixtures. These provide flexible lighting solutions as they can easily be adjusted to suit your lighting needs at any given time. Pendant track lighting: The great benefit of a track light is that they can be made to use only one light outlet. Yet there are multiple lamps spread over a large area. These can be found with modern styled fixtures or more traditionally styled. Add on modern lamp shade: a modern lamp, such as the Grito lampshade, can be added onto and transform existing pendant light fixtures. The Grito lampshade is made in a modern looking aluminum shape, and can add color to your kitchen. Wooden finished pendant lights work well in kitchens that feature wooden décor (wooden dining room tables, chairs, cabinets, etc.). 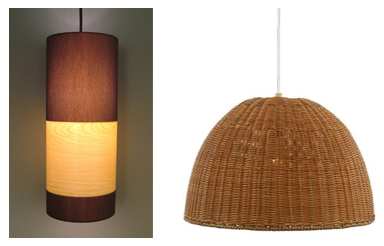 You can opt for hardwood looking light fixtures or a softer wicker wood pendant light. Luxury Pendent Lights: The Neutra by Ferruccio Laviani is a luxurious pendant light (costing $1075), ideal for large spaces. Available from YLighting. Neutra: designed by Ferruccio Laviani and made in Italy. Add Color: A Tiffany pendant light, or simple pendants with a colorful shade can add contrast to a kitchen’s design. Blue or red shades work well to create focal points. Blown glass pendant light: Light fixtures made out of blown glass add a soft and elegant touch to a kitchen’s ambiance. Drum lighting: A pendant drum light with its minimalistic design will add elegance in a modern kitchen. 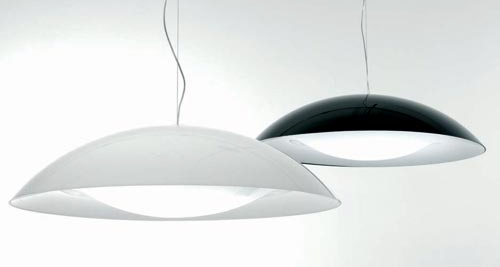 Cone lighting: Another style of pendant lighting that blends with modern kitchen design. Also an ideal option for kitchen island pendant lighting. Instant Pendant Lighting: An easy and quick way of adding pendant lighting to a kitchen, without doing any electrical work, is to add a plug in pendant light to an existing, standard light socket. Home Decorators Collections offers a brushed bronze instant pendant light for $40. Metals: Certain metal finishes suit different kitchen décor styles: A chrome pendant light will blend in with a modern, sleek looking kitchen. 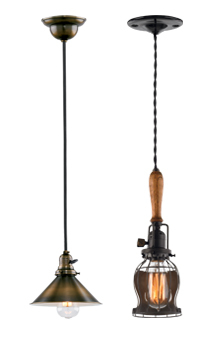 Whereas, a copper pendant light will work best in more rustic, traditional looking kitchens. Kitchen chandelier lighting: Chandeliers that are common in a kitchen are more in a wrought iron style. You can also find a lighted pot rack, which doubles as a light above a kitchen island, and holds the kitchen pots. Hanging Lanterns: These would be suitable for adding ambient lighting to a traditional, rustic styled kitchen. Lantern styles range from wrought iron Victorian, soft Japanese lanterns to a Moroccan pendant light.